Michael Schreiber and colleagues at the University of Bonn Institute for Computer Science have developed a new humanoid robot called NimbRo-OP. The robot stands 95 cm tall, which is just big enough for the “Teen Size” RoboCup Humanoid soccer class. Both hardware and software are open source, though the bulk of the hardware are off-the-shelf Dynamixel servos from Robotis. These include 12 MX-106 (about $500 each) and 8 MX-64 ($300 each). A fully assembled and tested prototype can be ordered from the university for about $25,000; a DIY-er could probably assemble one for about $10-$12K. So, not cheap, but not outrageous for a robot of this size and capability. NimbRo has an onboard dual-core PC, and can run Windows or Linux. The Linux software is based on the DARwin-OP software from Robotis, but sports some custom adaptations and enhancements. The robot also features a wide-angle camera, which is a great idea; too many vision systems suffer from a narrow field of view. It also has a 6-axis IMU, though that’s fairly standard these days. Check out the video below for a great introduction. 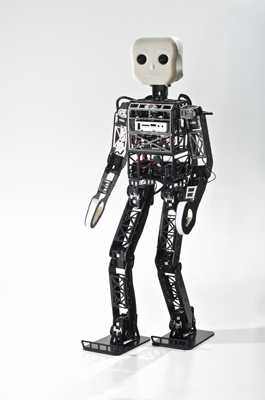 For more details, see the NimbRo home page, and related articles at robots.net and Robots-Dreams. This is so cool! Wish I could afford one!